Nearly $11 billion increase in building efficiency and solar power revenue drove U.S. growth and offset $7 billion decline in biofuels; advanced energy industry reached $1.4 trillion worldwide. Washington, D.C., Tues., March 7, 2017 – Today, national business group Advanced Energy Economy (AEE) released the latest industry data that shows advanced energy is a $200 billion industry in the United States and $1.4 trillion worldwide. 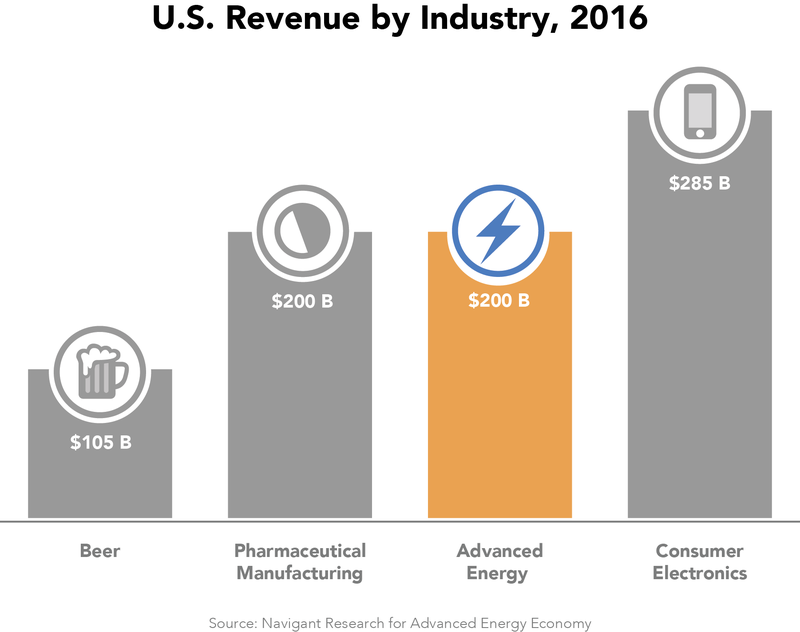 To put this in perspective, U.S. advanced energy revenue for 2016 is nearly double beer sales, equal to domestic pharmaceutical manufacturing, and approaching wholesale consumer electronics. Global revenue is almost twice the size of the global airline industry, and nearly equal to worldwide apparel revenue. Caption: Advanced Energy is a $200 billion U.S. industry, nearly double beer sales, equal to domestic pharmaceutical manufacturing, and approaching wholesale consumer electronics. 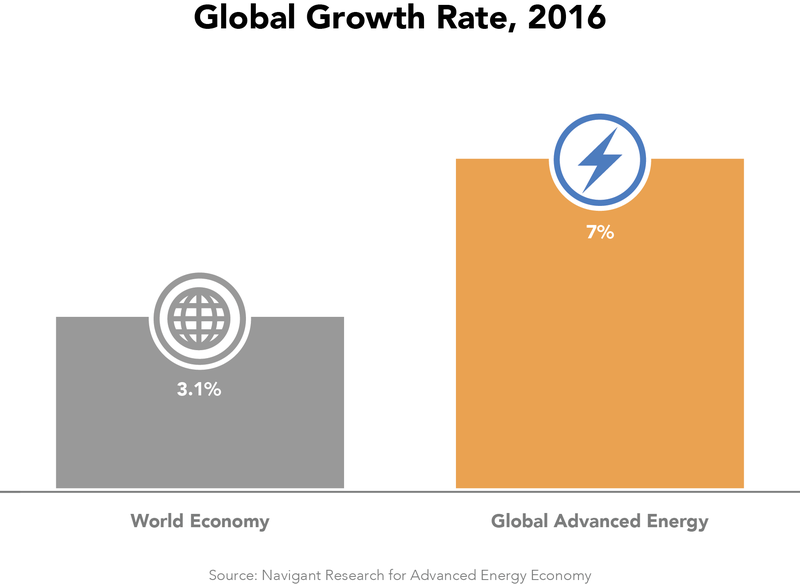 These are the top findings of the Advanced Energy Now 2017 Market Report, prepared by Navigant Research for AEE. The report includes global and U.S. revenue for the industry annually from 2011 to 2016, with data broken down by seven segments covering both supply and demand and 42 subsegments, representing over 100 specific product and service categories. The 2017 Market Report is available for download here. In 2016, strong growth in U.S. power generation and energy management technologies offset a sharp decline in fuels, especially ethanol, for growth of 1 percent overall, to $199.2 billion. 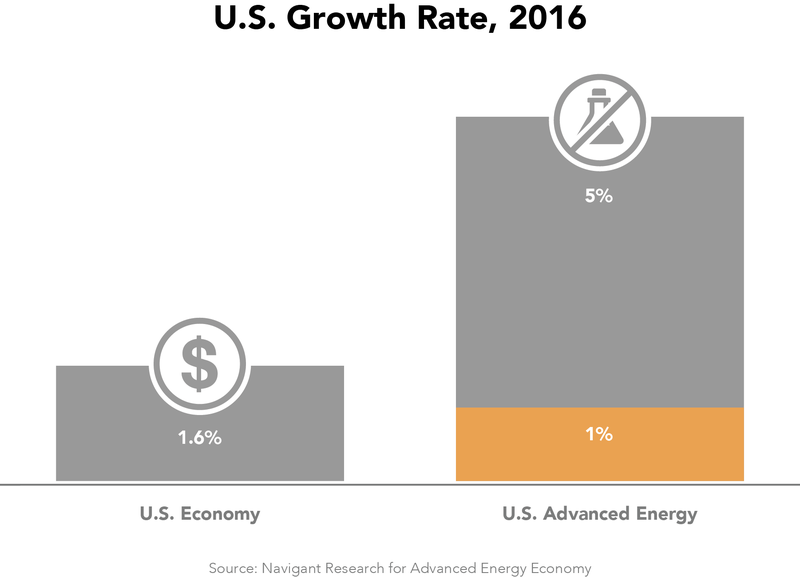 As in 2015, growth in the U.S. advanced energy market was impacted by persistent low oil prices. Ethanol pricing is highly correlated with oil prices, as well as prices for corn feedstock, which were also low in 2016. While production remained steady, ethanol revenue dropped 24 percent, from $27.3 billion to $20.6 billion. Without counting ethanol, the U.S. advanced energy market grew 5 percent in 2016, three times the growth of U.S. GDP (1.6 percent). Globally, 14 percent growth in products and services that make buildings more energy efficient led to overall revenue growth of 7 percent, double the 3.1 percent growth of the global economy, to a total of $1.4 trillion. Overall growth of 8 percent in Building Efficiency products and services was led by energy efficient lighting and commercial building retrofits, both up 7 percent, reaching $26.4 billion and $8.4 billion, respectively. 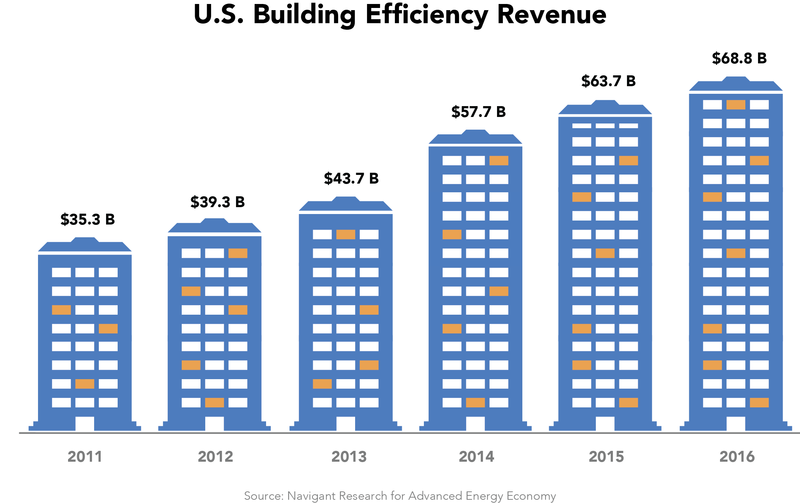 The largest segment of the U.S. advanced energy market, Building Efficiency revenue grew by more than $5 billion in 2016, to a total of $68.8 billion. Every single product category in Building Efficiency experienced growth over 2015. 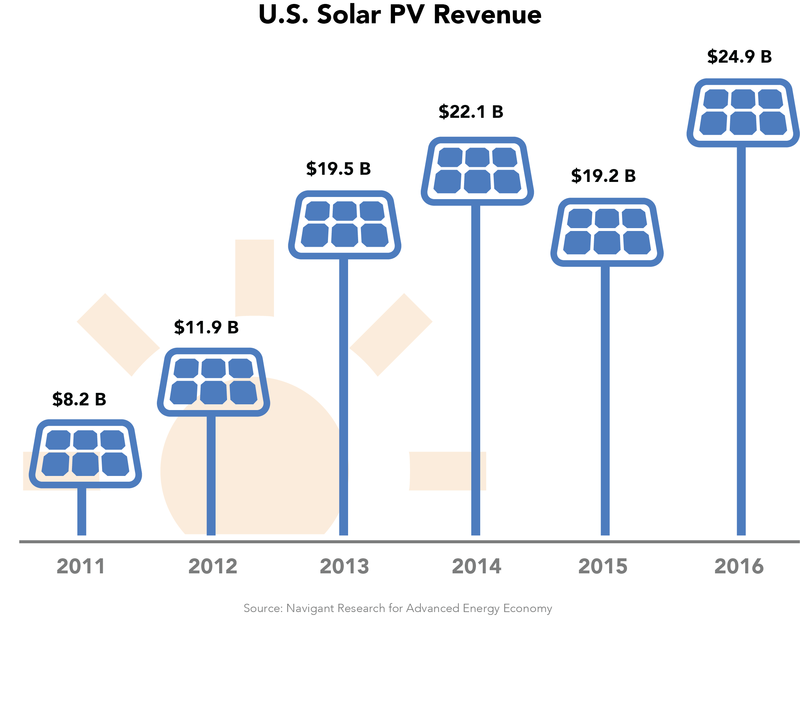 Power generation technologies were up 5% in revenue, led by solar, which capped off five years of growth with a 30 percent surge, a $5.7 billion increase to $24.9 billion, in 2016. 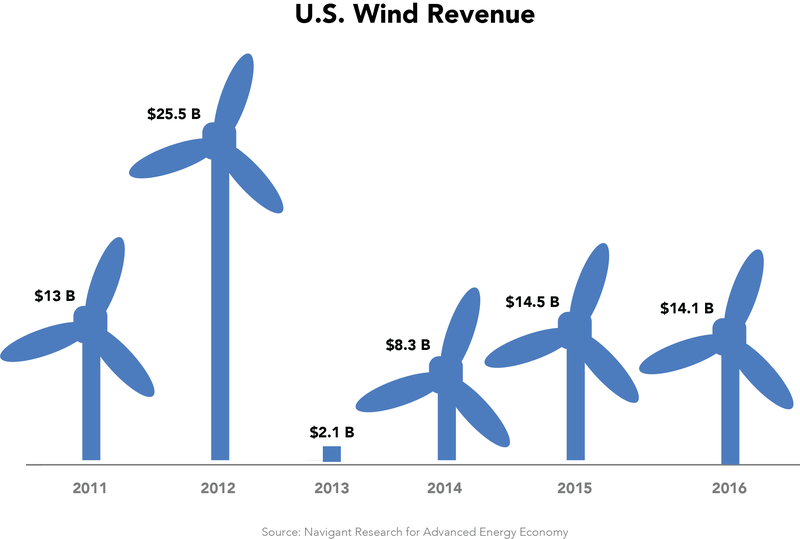 Wind revenue was relatively steady at $14.1 billion – a welcome change from the boom-and-bust pattern associated with the on-again, off-again federal Production Tax Credit (PTC) earlier in the decade. With a five-year extension and phase-out of the PTC on the books, the development pipeline shows installations of between 8 and 9 gigawatts (GW) of wind capacity annually from 2015 through 2018. Sales of fuel cells for onsite power jumped 21 percent, to $374 million. 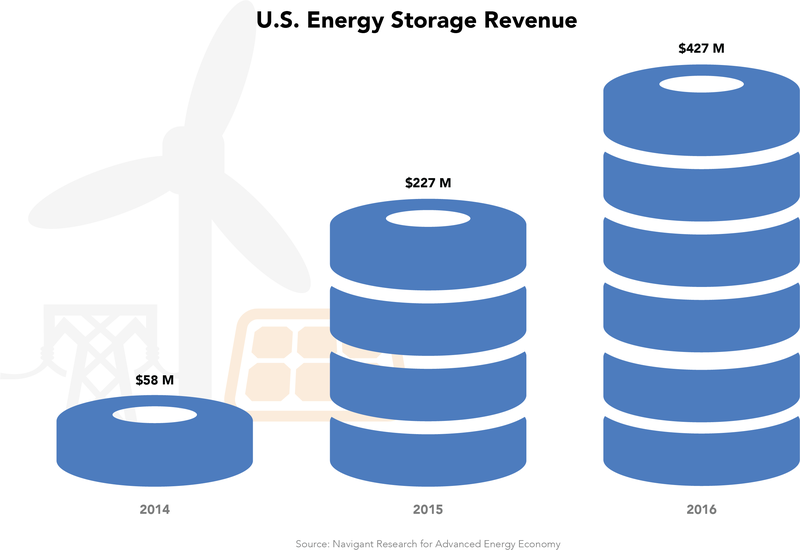 Energy storage also had another big year, with revenue jumping 54 percent, to $427 million in the U.S. In transportation, sales of clean diesel vehicles were down sharply, dropping 45 percent for a decline of $2.7 billion in revenue, likely the result of Volkswagen’s emissions violations. Revenue from plug-in electric vehicles (PEV) rose nearly as much as clean diesel revenue fell – up $2.5 billion – for an increase of 48 percent. 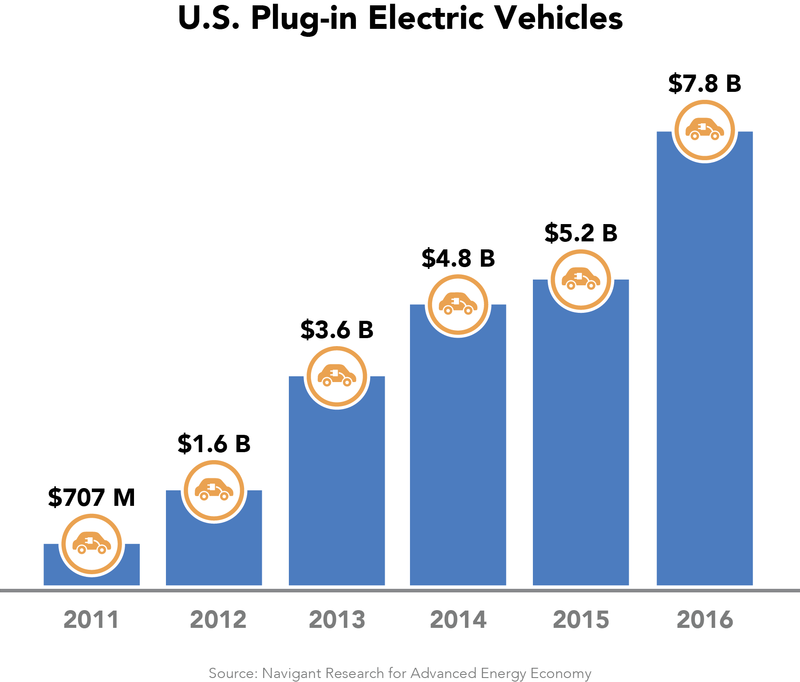 PEV revenue has grown tenfold over five years, from $700 million in 2011 to $7.8 billion in 2016, as these all-electric alternatives to gasoline power catch on in the marketplace. Under pressure from low gasoline prices, hybrid electric vehicles saw revenue fall for the third straight year, dropping 11 percent, to $8.9 billion. If this trend continues, revenue from PEVs may surge past hybrid vehicles this year. Investment in charging infrastructure for PEVs continues to increase as well, with revenue from charging stations surging 11 percent, to $182 million, up nearly 600 percent since 2011. Under price pressure from low prices of both oil and corn stock, revenue from ethanol fuel fell nearly $7 billion, or 24%, despite steady production levels. For the second year in a row, declines in ethanol revenue counterbalanced nearly all the growth in other advanced energy market segments. Revenue from ethanol sales has dropped by half from its 2012 peak of $40 billion, while investments in ethanol refineries have fallen from $1.9 billion in 2014 to zero in 2016. "We see a growth market in providing energy programs and demand-side management strategies for our utility clients, as well as institutional, commercial, and industrial organizations," said Aziz Virani, AEE Board Member and Chief Executive Officer and President of CLEAResult. "What we hear from our nearly 3,000 employees across the U.S. and Canada is that when you help people change the way they use energy, improve building and operations efficiency, and reduce energy bills, you also improve the customer experience." In addition to revenue data and analysis, the Advanced Energy Now 2017 Market Report contains 17 stories of key trends shaping the current and future advanced energy market, both domestic and global. Among these is the burgeoning trend of direct corporate purchasing of renewable energy, with technology companies like Microsoft, Apple, Amazon, and Salesforce taking the lead to power their data centers with advanced energy. Advanced Energy Economy is a national association of businesses that are making the energy we use secure, clean, and affordable. Advanced energy encompasses a broad range of products and services that constitute the best available technologies for meeting energy needs today and tomorrow. AEE’s mission is to transform public policy to enable rapid growth of advanced energy businesses. AEE and its State and Regional Partner organizations are active in 27 states across the country, representing more than 1,000 companies and organizations in the advanced energy industry. Visit AEE online at www.aee.net. 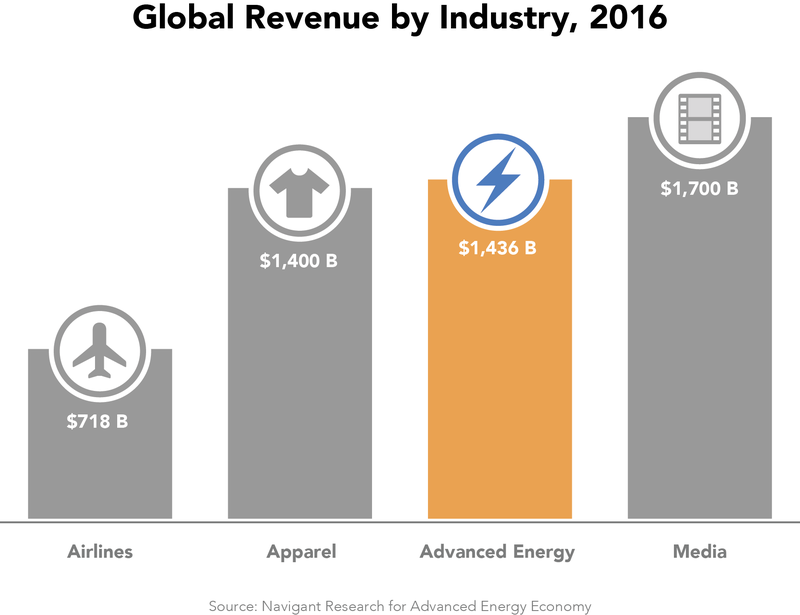 Navigant Research, a part of Navigant Consulting’s Energy Practice, is a market research and advisory group that provides in-depth analysis of global clean technology markets with a specific focus on the commercialization and market growth opportunities for emerging energy technologies. Our client base includes Fortune 1000 multinational technology and energy companies, government agencies, utilities, investors, industry associations, and clean technology pure plays. We provide these companies with market research reports, custom research engagements, and subscription-based research services. Navigant is focused across four research programs: Energy Technologies, Utility Transformations, Transportation Efficiencies, and Building Innovations. Additional information about Navigant Research can be found at www.navigantresearch.com.